I remember watching a repeat episode with the seafood chef Rick Stein on his travels in France and he made a Pithivier. It really did look temptingly good. Pithivier pronounced [pee-tee-VYAY] are large round, enclosed pies normally made with puff pastry which is then traditionally filled with frangipane, also known as almond cream. Then pastry top is then finished off with a glaze, either by egg-wash or by the caramelising a thin layer of sugar at the end of the cooking process. 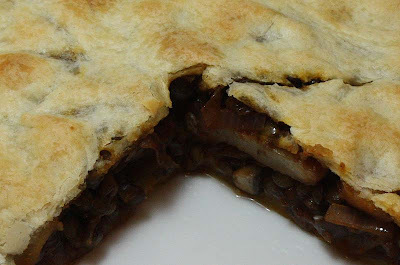 You will also find savoury versions of this pithivier, sometimes filled with meat or cheese. I decided to make a savoury one with a seasonal vegetable: the Jerusalem artichoke. Oh and one more thing about pithiviers, the tops are traditionally and skilfully decorated in the style of scallop shells, well as you can see mine is not at all elegantly presented but it sure was flavourful and nutty. Unfortunately, Jerusalem artichokes are not appreciated by everyone, one of the reason for this is its after effects on the human body: flatulence, but my attitude it, if you only eat it a couple of times during its season, it’s a small price to pay. I have also found Jerusalem artichokes to be such a versatile ingredient. I only became aware of this when I started growing my own. Upon digging my first batch early last year, I wondered what on earth was I going to do with so many of these knobbly tubers. Since then I’ve made Jerusalem artichoke and walnut parcel, Jerusalem artichoke crisps, Jerusalem artichoke gratin, Jerusalem artichoke soup and stoved Jerusalem artichokes. If you are thinking of growing them, be warned that once you’ve got them in the ground, you have got them pretty much for life. So do think carefully about planting them and where. Saute the artichokes and shallots in the olive oil in a large frying pan until softened and slightly golden. Add the mushrooms and rosemary and cook for a further 2 or 3 minutes before adding the red wine, chopped tomatoes and tomato puree. Simmer for 15 minutes or until sauce has thickened. 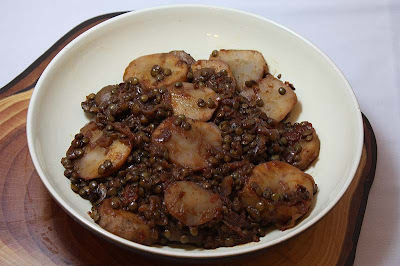 Remove the rosemary sprig and add the cooked lentils. Roll the pastry sheets into two thin circles, but make one slightly bigger than the other. Place the smaller on a baking sheet and top with the filling, leaving enough of a border. 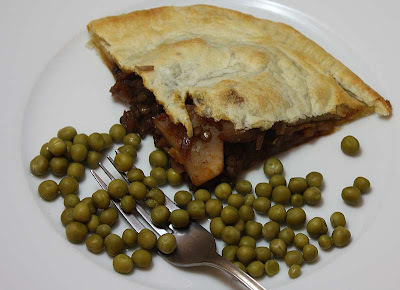 Cover with the larger circle, pressing the edges neatly together and crimping with your fingers or a fork. Make a hole in the centre and brush the pastry with the egg or soya glaze and bake for 20 – 25 minutes until puffed and golden. If you wish you can make 4 individual pithiviers. Adapted from the Vegetarian Society. Original recipe can be found here. How timely is this post I have some that need to be dug up and now I have some great recipes to try. They aren't to established and I'm not sure if I'm going to keep on growing them, it will all depend on how they turn out in the future recipes. Mmmmmmm, that does sound good, you know I am a sucker for mushrooms and I like the artichokes too. I am glad you explained how to pronounce it! Well I have never had this dish, but it looks great! P.S. Mangocheeks are you feeling better? mm, sounds delicious and the name sounds like a ballet movement! I've never tried Jerusalem artichokes but fancy having a go at growing them. Perhaps I should try eating them first to see if I like them before subjecting my plot to having them for life though. I so love Jerusalem artichokes!! They are called aardperen in Dutch. I make soup of them , roast them in the oven or make a puree of them,..I want to try this lovely dish!! MMMMMM,...looks very inviting, my friend! yummm.... delicious! i just love artichoke! I grew a variety called fuseau last year and in their first year I found them a good size, perhaps they need to be growing a tad longer to be a reasonable size. I do hope you enjoy some of these recipes, the parcels and the crisps were my favourite. And Yes, I am feeling much better. Thank you for asking. Jerusalem artichokes are def. an acquired taste. I'll eat them, but wouldn't say I love or like them. So please do try them and see what you think. Thank you for sharing the Jerusalem artichokes Dutch name. Your right in pointing out its versality. I like it roasted too, but you have to be careful - too much and its mush (ugh)...I don't like mash very much (sorry). Thank you Justyna. You have a lovely day too. This looks like another lovely recipe. On the flatulence issue, I was reading in Rachel Demuth's Green Seasons that if you boil the artichokes for 10 mins, throw away the water and then prepare them in whatever way you like that this minimises the gas problem. I tried it with soup this weekend and it seemed to work! I'll try it and see if it works with my next Jerusalem artichoke dish and will report. But if you are saying you saw a result, there must be something to it.